How animation has grown up! Early animated features like Snow White and Sleeping Beauty with their simple plots, catchy tunes, and happy endings were clearly meant for children, but as the medium progressed and developed it became more mature. Whether dealing with anxiety (Frozen), social impotence (The Incredibles), miscarriage (Up), or the inevitable fact of our own mortality (Toy Story 2, yikes! ), animated features are becoming more and more adult. The How to Train Your Dragon series demonstrates this perfectly. In his first outing, Hiccup was out simply to prove his own worth. He made his dad proud, saved the day, and everyone got an easy, happy ending. Here, Hiccup realizes the fiercest dragons are within and must find a delicate balance between giving up his childish dreams yet not losing faith in those he loves. It’s a magnificent adventure with brilliant visuals, a fantastic story, and important themes seamlessly weaved throughout. Dreamworks, in short, made a Pixar film. It’s been five years since Hiccup (Jay Baruchel) established peace between his homeland and the dragons, and this third-rate dweeb has turned into a handsome, confident explorer who his father, Stoick the Vast (Gerard Butler), hopes will succeed him as village chief. On a routine cartography mission, he is ambushed by a band of dragon trappers led by Erit (Kit Harington) who promptly announce that Drago Bludvist (Djimon Hounsou) intends on stealing all the world’s dragons to create an army. Luckily, Hiccup finds an unlikely ally when he discovers his estranged mother, Valka (Cate Blanchett), a Jane Goodall recluse who avoids humans and lives with thousands of dragons in a secret hideaway. At this point, they should team up, defeat Drago, and live happily ever after in dragon paradise. Yet, this is only the setup to a much more complex and tragic tale that ends in a spectacular dragon fest to rival the best live-action fantasy movies. In a heart-wrenching scene, Hiccup realizes that his father was right this time, and while anyone can change, some people simply choose evil. Hiccup assumes responsibility and leads the attack against Drago. Throughout the centuries, theologians have tried to reconcile “turning the other cheek” with “sell your cloak and buy a sword,” culminating in the Just War Theory. Dragon 2 is a great illustration of this. Part of Hiccup’s initial naïve personality is a lack of proper respect for natural laws. Despite their anthropomorphic traits, dragons are still animals. Valka explains to Hiccup that they operate on a hive instinct under the protection and guidance of an Alpha dragon. In a case of extreme dimorphism, the Alphas are the size of skyscrapers—perhaps a distant cousin of Godzilla. Drago uses this trait to force otherwise loyal dragons to follow him. Hiccup refuses to believe that his faithful dragon Toothless could turn on him, a stance that has devastating results. While Toothless’ loyalty eventually returns, Hiccup must learn to use this instinct to his advantage rather than fight a dragon’s nature. Many of Catholicism’s controversial teachings come from a realistic view of the natural laws inherent in the world. You can’t fight human—or dragon—nature. However, you can use nature in a holy manner. As the sophistication of writing increases and the cost of production decreases, there will be more animated films like this in the future, maybe even with PG-13 or R content. 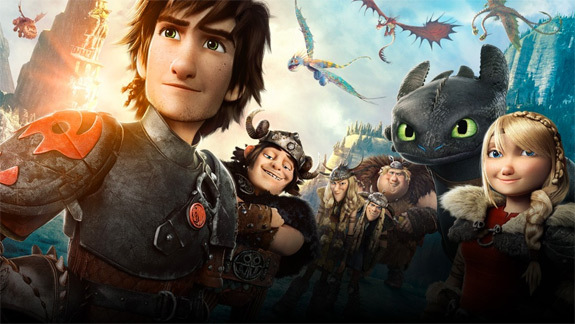 How to Train Your Dragon 2 does not fit with most other animated films but finds its place among the great coming-of-age stories like The Sandlot, Old Yeller, or the Eighties films of John Hughes. Hiccup finds his true self, not on his own, but as part of a community that includes a responsibility to others. This self-discovery comes not from rejecting his family but seeing it completed with the return of his mother. Finally, the film has the courage to show that growing up is hard and often fraught with pain and suffering. Pro-family. Pro-stewardship. Pro-responsibility. Pro-awesome dragon fights. What more could you ask for?